The new DROID RAZR wasn’t the only device Motorola had in store for us today, they also announced a new Android device called MOTOACTV. This is basically a smart watch powered by Android like we’ve seen in the past. 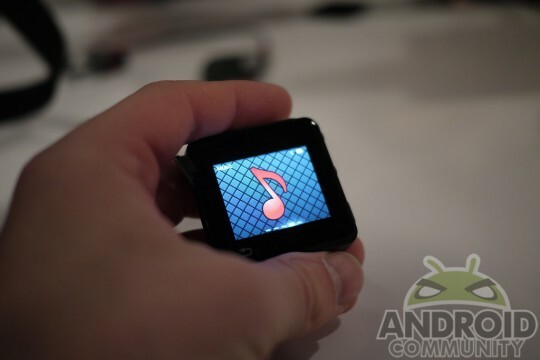 Taking on Nike+ and even the iPod Nano will this be a success for Motorola? We don’t know yet but check out our hands on pictures and video after the break. Running on Android with a 600 Mhz processor and weighing only 35 grams the ACTV sounds pretty impressive. Would you wear one? It may be lightweight, water and dust-proof but it’s a little bulky for a watch. I’d love to mount one to my Trek EX8 mountain bike just as they’ve done at the Motorola event. It pairs with your Motorola phone or RAZR and will send and receive alerts, notifications as well as function as a full out media player with wireless bluetooth headphones. The MotoACTV features GPS for location tracking, and the Bluetooth headsets even can take your heart rate. Then calories and miles ran, walked, or cycled can all be uploaded wirelessly right to MOTOACTV.com for real time stats and tracking both during and after your workout. Pair all of this with 8 or 16GB versions that will be a fully functioning media player this might actually be the perfect solution for some. The device will pair with your smartphone and stream music, or you can use the internal storage to upload as much as it’ll hold. We don’t know anything else extremely specific about internal specs other than the 600 Mhz processor. MotoACTV all around looks pretty great and I could see myself using one, but the price has me a bit worried. Coming in at $249 for the 8GB model and $299 for the 16GB variant the pricing is too high and is quite a bit for a watch/remote although it does function as a decent 16GB media player. Until we get more hands-on time we’ll reserve our judgement. Feel free to look over all the photos in the gallery below.